U.S. Ag Secretary Tom Vilsack is suggesting the Army Corps of Engineers should be more nimble in responding to weather events that impact the agency’s management of the Missouri River. Farmers and others along the Missouri River have complained about the way the Corps managed the release of water from upstream dams last year — leading to massive, long-term flooding along the river corridor. Vilsack this morning told reporters the Corps needs to build “more flexibility” into its management plan for the Missouri. According to Vilsack, the Corps should “be more engaged” in an on-going review of its management plan for the Missouri or any other river. Vilsack, a former Iowa governor, made his comments this morning during and after taping of an appearance on Iowa Public Television’s “Iowa Press” program which airs this evening at 7:30. 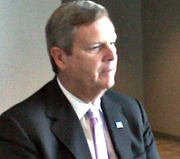 During the show, Vilsack indicated he would like to continue as the nation’s ag secretary if President Obama wins a second term. Vilsack suggests the farm economy is one of the bright spots President Obama can emphasize in the 2012 campaign. Vilsack is flying back to Washington, D.C. this afternoon after speaking at a Des Moines-area “life science” company that converts farm commodities into ingredients used in prescription drugs, nutritional supplements and beauty products.